Musical Night Light With 3 Lullabies and color changing light, great for nursery lamp, baby soother, night light, baby bedroon decor. Colorful gradient light provides a soft night glow and gently changes. 3 build-in Lullabies soothe your baby rest more peacefully. 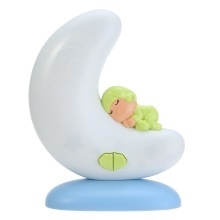 Crescent moon shaped night light with a sleeping baby on it. Can serve as a night light to accompany your children to sleep. Excellent decor as night lamp in baby room, add an elegant glow.